Editor’s note: This article is the edited verion of the article “Consumer Perception of Fine Lines and Wrinkles Assessed by Qualitative Methods,” which ran in the January 2013 issue of Cosmetics & Toiletries magazine. All rights reserved. Researchers from L’Oréal USA conducted a study on women’s perception of wrinkles and fine lines on the face, as well the related skin care needs. Broken into age-based groups of 41–50 years old, 51–60 years old, and 61-70 years old, the study’s particpants showed a distinct understanding of the differences of fine line and wrinkles, although distinct differences were seen between age groups. The different age groups also had different feelings about what kind of skin care product would best treat their skin concerns, as well as what their expectations were for a quality outcome. Marketing campaigns for various anti-aging portfolios share a common vocabulary. Wrinkles are correlated to either “loss in skin elasticity,” “dryness” and/or “lack of firmness,” to name a few. Moreover, products geared toward wrinkles often are described as “rich creams” versus lotions, gels and/or other product forms. In contrast, products addressing fine lines are more ambiguous in nature, and not necessarily branded specifically to address fine lines. Instead, they use advertising cues such as “renews lackluster skin,” “lightweight formula” and/or “nourishes skin.” They also typically are presented as moisturizers or lotions rather than creams, which suggests a lightweight, less viscous composition. While these well-established market strategies for aging descriptors exist, it is crucial to investigate consumers’ perceptions of fine lines and wrinkles, to determine whether current market and product development strategies align with the core values and expectations of consumers, as well as to provide insight for anti-aging skin care. This exploratory study implemented in-depth qualitative interviews to assess consumer perception of fine lines and wrinkles on facial skin. The primary objectives were to derive definitions for each aging descriptor as well as determine how they are differentiated, if at all. Results indicated consumers have varying definitions for these descriptors, although certain opinions are unanimous across age groups. Older consumers correlated aging descriptors with certain skin concerns, and younger consumers discussed fine lines and wrinkles in a more objective sense, as will be shown. For this study, 60 mass and prestige product consumers were recruited from the Clark, New Jersey area by phone and screened with the inclusion criteria: Caucasian female, ages 41–70 years old, with self-perceived fine lines and wrinkles on her facial skin. Subjects were divided equally into 20 per each of the following age categories: 41–50 years, 51–60 years and 61–70 years. In-depth qualitative interviews of approximately 1.5 hours per subject were conducted. Panelists were naive to the study design, had no prior special training and received compensation for their participation. Panelists were interviewed individually in a closed, one-on-one setting. First, the interviewer established a rapport with the subject and obtained demographic information. Subjects were then re-screened to ensure suitability for participation in the study. Finally, the interviewer explained the experimental design, specifically noting there were no correct or incorrect answers for any of the questions asked. Also, the interviewer emphasized that subjects were not being “quizzed” for their knowledge on fine lines and wrinkles in any capacity, but instead probed for their open, candid opinions regarding these descriptors. Subjects were then asked a series of questions by the interviewer and verbally provided their individual opinions in an honest and explanative manner. They were informed that questions may sound repetitive at times but were asked to remain patient and provide thorough feedback during the interview. To ensure accuracy when transcribing the responses, the interviewer confirmed each subject’s answer verbally. Feedback suggested that participants were comfortable with the study design and one-on-one interview set-up. They did not find the interview process or questions presented to be cumbersome. The interview guide is depicted below in a cluster-type arrangement by information category. Interview questions were presented to all subjects in the order listed here. Individual ‘textbook’ definitions: How would you define a fine line as it pertains to your facial skin? Are there different degrees of fine lines? If yes, please explain. How would you define a wrinkle as it pertains to your facial skin? Are there different degrees of wrinkles? If yes, please explain. Visual definitions: What do you consider to be the visual signs of fine lines; that is, what do they look like? What do you consider to be the visual signs of wrinkles; that is, what do they look like? Visual awareness: When did you first become aware of the appearance of fine lines on your face? At what age and/or time in your life? When did you first become aware of the appearance of wrinkles on your face? At what age and/or time in your life? Differentiation and/or correlation between descriptors: How do you distinguish between fine lines and wrinkles on your face? i.e., difference in texture, skin feel, depth of lines, etc. Based on appearance, how are fine lines and wrinkles different, if at all? Can a fine line be a wrinkle? If yes, explain. Causes and/or factors: What factors do you feel cause fine lines? What factors do you feel cause wrinkles? Are the factors the same? Different? Self-perception of descriptors: Do you find more fine lines or wrinkles on your facial skin? Explain how you draw this conclusion. Do you find that fine lines are more likely to appear in certain areas of your face than wrinkles? If so, in what areas do they appear the most? i.e., eye area, around the lips, on the forehead, etc. Do you find that wrinkles are more likely to appear in certain areas of your face than fine lines? If so, in what areas do they appear the most? i.e., eye area, around the lips, on the forehead, etc. Emotional perception of descriptors: What feelings, positive and/or negative, do you associate with fine lines, if any? What feelings, positive and/or negative, do you associate with wrinkles, if any? Skin care routine and correlation to descriptors: How do you choose a skin care product for fine lines? Is there anything you look for, in particular? i.e., claims, texture, ingredients, etc. How do you choose a skin care product for wrinkles? Is there anything you look for, in particular? i.e., claims, texture, ingredients, etc. Skin concerns: Which of the following are you more concerned with at present: facial skin free of fine lines, or facial skin free of wrinkles? Please explain your choice. The third group, ages 61–70, defined fine lines very narrowly; that is, they associated them solely with the eye region of facial skin, describing fine lines as crow’s feet. The first group, ages 41–50, compared to the remaining groups, defined fine lines in the most impersonal manner—thin lines on facial skin. Responses for factors causing fine lines and wrinkles were comparable by age group, with sun exposure, aging and facial expressions cited most frequently. For areas of the facial skin most susceptible to fine lines, the three groups unanimously cited the eye area. For areas most susceptible to wrinkles, responses were comparable among the age groups. Responses for the ideal skin care formula for fine lines varied among age groups. The first group indicated that product smoothness, non-greasy texture and feel, and absorption were critically important attributes for fine lines. The second and third age groups’ responses varied only slightly. The second group cited adequate moisture as a key element for facial skin care directed to fine lines, while the third group indicated consistency; i.e., a viscous, thick and creamy consistency was considered necessary to address fine lines. This aspect of the interview process provided much insight into the varying mindsets per age category. Consumers in the first age group, 41–50 years, were mostly concerned with a lightweight, comfort-oriented skin feel. They did not want to “feel” the product on their skin per se, but rather enhance their skin visually. By comparison, consumers in the third age group, 61–70 years, indicated preference for a heavier, denser and richer product; that is, a product with a thicker consistency, to which they correlated a moisturized skin feel. 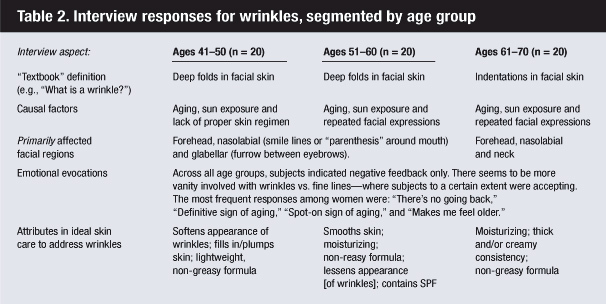 Similar to findings for fine line skin care, responses for the ideal anti-wrinkle formula differed among the age groups, as seen in Table 2. For wrinkle-specific skin care, consumers listed minimized wrinkles, plumper skin and a lightweight, non-greasy formula as core expectations. Again, consumers in this age category were comfort-oriented in addition to their wants and/or needs for wrinkle-targeted skin care. In slight contrast, consumers within the 51–60 age category associated moisture and UV protection with wrinkle-specific skin care. Also, UV protection was not mentioned as a necessity for the first and third age categories, despite sun exposure being listed in all age groups as a causal factor for wrinkles. Lastly, consumers within the 61–70 age category had formula-specific ideas for anti-wrinkle skin care. As cited for fine lines, consumers in this category required a thick, viscous formula consistency, which was associated with moisture and smoothness. This correlation is quite logical, as older consumers indicate that their facial skin is more susceptible to dryness than it was in younger years. They also draw the conclusion that dry facial skin yields a cracked skin appearance, which aligns with the visual cues for both fine lines and wrinkles. Therefore, a skin care product that properly addresses issues of inadequate moisture and/or hydration should minimize the appearance of both fine lines and wrinkles. Research, development and marketing of successful anti-aging skin care products are driven by consumer needs. This study shows how consumers across varying age categories were capable of astute observations regarding their individual skin requirements, specifically for fine lines and wrinkles. The most important finding was that consumers had a well-established vernacular for these aging descriptors as well as what they considered their ideal product form to address fine lines and/or wrinkles. In addition, consumers differentiated between fine lines and wrinkles. Therefore, the overall conversation was dependent upon the descriptor. For emotional perception, responses were intrinsically different by both age and descriptor categories. Findings suggested that fine lines are more tolerable than wrinkles, as wrinkles are indicative of an irreversible step in the aging process. Also, based upon feedback for the ideal wrinkle skin care, older consumers did not expect drastic results. Instead, they tailored their expectations to an overall healthier skin appearance, which they indicated would help to minimize the appearance of wrinkles—not remove and/or fix them. It is reasonable to hypothesize that this type of consumer would respond well to reasonable product claims, which specifically speak to healthier, smoother, moisturized skin. Further studies may be carried out regarding the believability of anti-aging skin care claims and sub-grouping findings by different age brackets. The present findings indicate that consumers are able to distinguish between fine lines and wrinkles on their facial skin and that they rate each descriptor by depth. Lines appearing closer to the surface of the skin are considered fine lines, whereas lines deeply indented into the skin are considered wrinkles. By this logic, it is reasonable to conclude that consumers have an identifiable “formula” for classifying fine lines and/or wrinkles by the depth of an indentation on the facial skin. Rosanna Mootoo, Stephanie Basile, Cristina Stroever and Christian Oresajo work in research and innovation for L’Oréal USA, and are based in Clark, New Jersey. A selection of interview responses, segmented by age, from L'Oréal USA research on consumer perception of fine lines and wrinkles.